Summer weather arrived a month early, as though a switch suddenly flicked on. This happened a couple days ago and the high temperatures are expected to continue through the weekend. It is not often that the West Coast has the highest temperatures in the country; Arizona, Texas, Florida and parts of the Midwest usually have us beat. A ridge of high pressure hangs over the Pacific coast, creating unusual heat for this time of year. As a rule, we do not experience this kind of weather until late June or July. It reached 91˚ In The Woods yesterday. We were tempted to jump in the river, except that the water is still very cold this early in the season. James joked that we should buy wet-suits! Our bodies are trying to adjust to this abrupt turn of events. We’re used to sleeping with lots of blankets, which are now way too heavy at night. I suggested that we pack away the flannel sheets we’ve used since last Fall, but James thinks it will cool off again. He’s probably right. He reminded me that when we first arrived here last June, it SNOWED on the upper highway, and there was sleet in our little valley. So this heat-wave is probably a false summer, and we hope that it is temporary. James brought out his sarong and retired his sweats. He put away his heavy clogs, took off his socks and donned flip-flops. He took off his shirt. I quickly followed suit. Although I was rather awkward wearing a sarong last summer, my reservations seem to have disappeared this year. It truly is more comfortable, and the best way to deal with the heat — especially since we don’t have air-conditioning. I may even come to feel at ease wearing a sarong around people when they visit us, but I am NOT quite ready to parade in a skirt on the streets of “Big Town”! If someone were to come along this way and see us in this get-up, they would probably think that we belong to some sort of far-out religious order. Perhaps that assessment is accurate — James and I are sort of in an “monastery of two”. We could probably walk around naked on this land if we wanted to (and have, briefly, on occasion), but we don’t want to scare the summer people. Much. So a sarong feels perfect here. We used them as window coverings all winter. Now that we’ve taken them down to wear, the early morning light filters into the Music Room and urges us out of bed. This is a very good thing, because the early morning is the coolest and most pleasant time to be awake and productive in the summer. We got up shortly after six today (early for us former “theatre people”!) and James suggested that I bring the video camera out to an area of the Woods which he calls “The Secret Garden”. A great variety of spring flowers are popping up, almost overnight. I don’t know that much about flowers, but could identify buttercups, mountain daisies, several kinds of lupine (lots of that!) 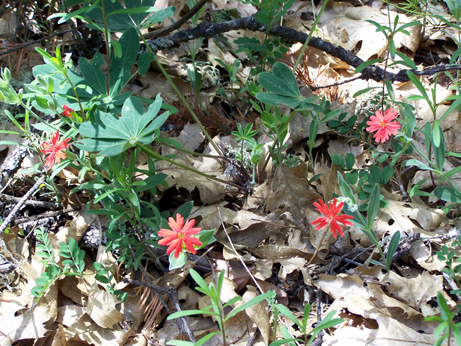 two varieties of Indian paintbrush, star tulips (very rare here) and bluebells. 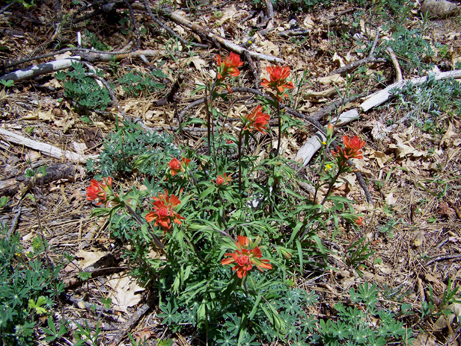 Mountain flowers have a subtle, economical beauty; they’re often tiny. The visual impact doesn’t hit you over the head like a field of tulips would; you have to look closely to appreciate the mountain flowers’ charms. They are here for a fleeting moment, then soon disappear and are replaced by new varieties. The blankets of lupine in the meadow are a bit more dramatic. You’ll see them towards the end of the video. We think they’re gorgeous. The first day of May was gorgeous here; sunny and mild, not a cloud in the sky. In the late afternoon we took our walk, and I shot continuous footage during the twenty minutes it took to meander down the path near the barn, then through a protected area where the bleeding heart flowers are in full bloom. The trilliums are still hanging in there, too. Further along the path, the piles of large rocks are a legacy from the Chinese workers who cleared them from the dredging areas blasted by water, the miners seeking gold. The coolie laborers organized them into neat piles. James is convinced that they did this in a conscious, artistic manner, in spite of what must have been extreme hardship. The faint echoes of the Chinese blood, sweat and tears still whisper through these woods, but as L. commented recently, “But it’s not as strong as when I first saw this land forty years ago”. In any case, the huge piles of boulders inspire awe. It feels like a sacred place. Then on to the river, and up the path leading to L.’s cabin, and back through the meadow to the barn. I edited the video to about three-quarters of its original length, which is still fourteen minutes long. Since YouTube’s video limit is ten minutes, I split the Woods walk footage into two parts. 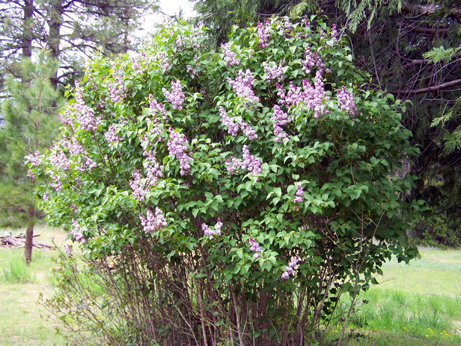 L.’s lilac bush is in bloom in the side-yard north of the Bunkhouse. 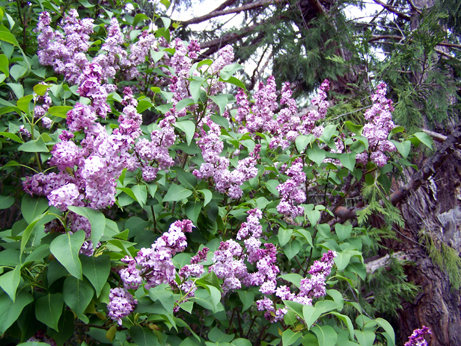 Shortly after this picture was taken, James cut several sprays of the fragrant purple blooms and brought them down to L.’s house in Nevada City. So now she gets a whiff of The Woods whenever she enters her kitchen.